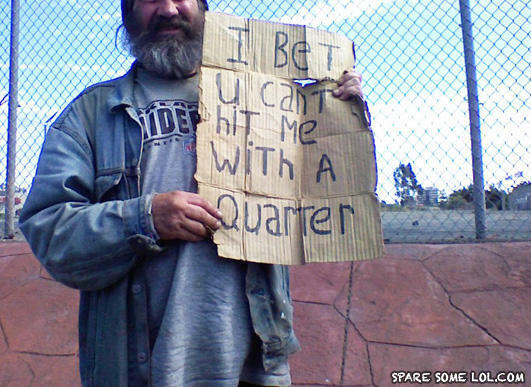 hahah iwould so throw a handful of change at him. I bet I can hit you with a bullet though! HEY WHERE ARE YOU GOING? Moral: BANG BANG BANG... your mom. Bet you can't me with 'TWO' quarters!!! Maybe not but I bet I could hit you with a rock. so if i hit you does that mean i get your quarters? Oh yeah? Take this, and this, and this, and this, and this! Hah I bet you cant dodge paper dollars? Take this and this... Damn! You wont be able to dodge this suitcase full of gold bars though. *hits guy and kills him* told you so... And you where so close too... Moral: MWAHAHAHAHAHAHA! Nah I cant, but... *BANG!*... I can still hit you with a bullet!